On Wednesday, the Environmental Protection Agency ordered Oklahoma drillers to shut another 17 fracking waste injection wells. This follows the US Geological Survey’s upgrading last weekend’s earthquake to 5.8 magnitude – a record for the state – from the previous estimate of 5.6 magnitude. More here. Back in January, Oklahoma got the dubious distinction of having set a record for number of earthquakes in 2015: 857. That’s more than all the remaining states (excluding Alaska) combined. This morning people were shaken out of their beds by a 5.6 temblor, prompting state regulators to shut down 37 fracking waste injection wells. Before 2009, Oklahoma got only a couple quakes a year. By the end of 2013 they were tallying 109, and measured 230 quakes in the first six months of 2014. "Some parts of Oklahoma now match Northern California for the nation’s most shake-prone," writes Doug Stanglin of USA Today, "and one Oklahoma region has a one-in-eight chance of a damaging quake in 2016, with other parts closer to one in 20." NBC News reports that this morning's quake was centered in north-central Oklahoma near Pawnee, on the fringe of an area where regulators had stepped in to limit wastewater disposal. Oklahoma isn't the only frack-quake prone area. Ohio has experienced them, too. 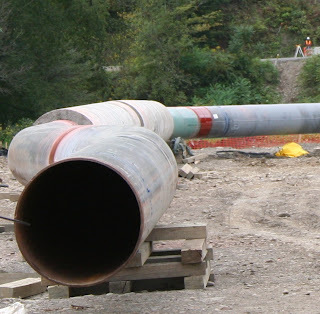 On Friday, April 22 officials from the New York State Department of Environmental Conservation (DEC) announced the denial of the Clean Water Act Section 401 Water Quality Certification for the proposed Constitution Pipeline. Their reason: these certificates fail to meet New York State's water quality standards. You can read the full decision, outlined in a letter by John Ferguson, Chief Permit Administrator here (pdf). The Constitution pipeline, a partnership between Williams Partners, Cabot Oil and Gas, Piedmont Natural Gas and WGL Holdings, was approved by FERC in December 2014. 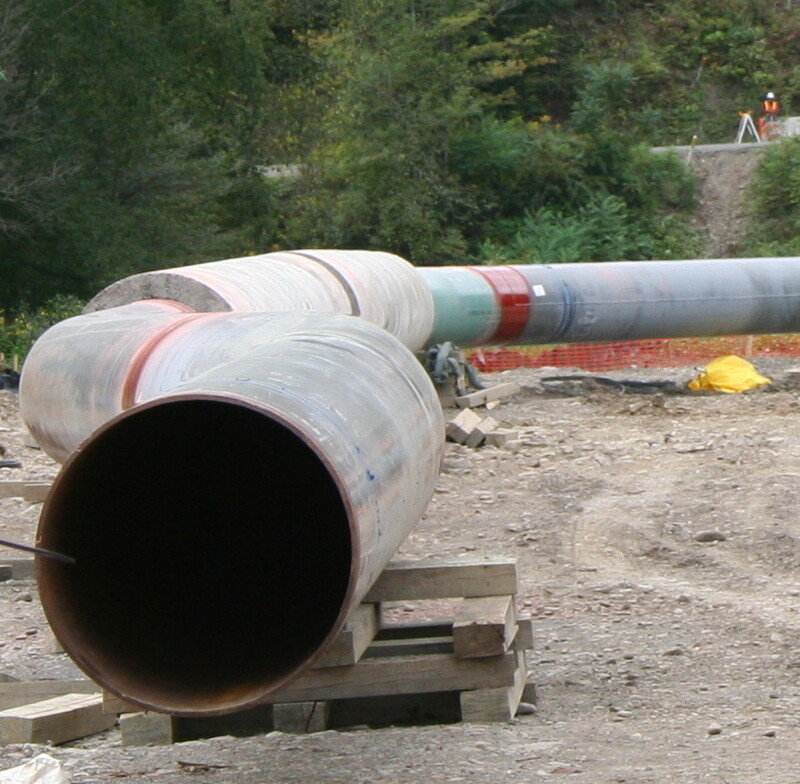 The proposed pipeline would transport gas from Susquehanna County, PA to Schoharie County, NY along a 124-mile route. In NY, Constitution proposed nearly 99 miles of new right-of-way for the 30-inch diameter pipeline, rather than co-locating within existing rights-of-way. DEC told the media that the agency had requested “significant mitigation measures” to limit impact on the 251 streams along the route. Many of those streams are unique and sensitive ecological areas, including trout spawning streams, old-growth forest, and undisturbed springs, which provide vital habitat and are key to the local ecosystems. In addition, DEC requested that Constitution provide a “comprehensive and site-specific analysis of depth for pipeline burial to mitigate the project's environmental impact”. According to DEC’s announcement last week, Constitution failed to do this, providing only limited analysis for 21 of the 250 streams. The problem, notes DEC, is that pipes not buried deep enough can become exposed, and any action to correct problems could further affect streams and water quality. The company claims that they worked closely with DEC staff for more than three years to make sure that water quality concerns would be adequately addressed. 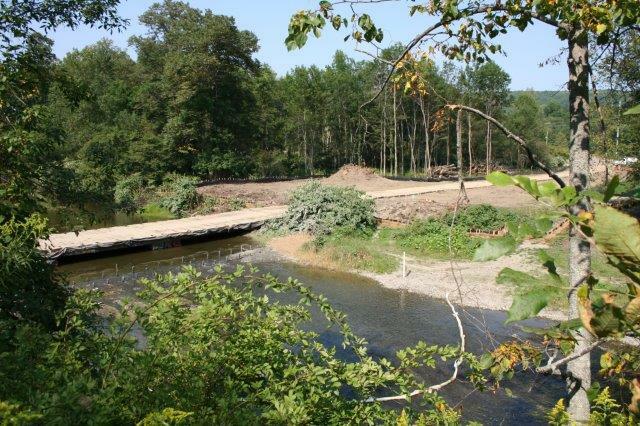 “Completely contrary to NYSDEC’s assertion, we provided detailed drawings and profiles for every stream crossing in New York, including showing depth of pipe. In fact, all stream crossings were fully vetted with the NYSDEC throughout the review process.” You can read their entire statement here. If you've been paying attention to news on various pipeline projects in the region, then you've heard about cutting sugar maples for a pipeline that may or may not ever happen, and the eminent domain fights happening in PA and other states. Or you've heard about the Keystone pipeline leaking, and others blowing up. What does this have to do with FERC? The Federal Energy Regulatory Commission has a role to play in deciding who has rights to put in pipelines and where - and therefore, who really has a "right" to the land in question. “Are You Being FERCed?,” sponsored by People for Healthy Environment, Food and Water Watch, We Are Seneca Lake and the Finger Lakes Sierra Club, is a public forum set for April 21 to discuss land rights and the role of the Federal Energy Regulatory Commission in deciding who has rights to the land. The forum will be held at 6 p.m. Trinity Episcopal Church, 304 N. Main Street, Elmira. Topics for discussion will include riparian rights, eminent domain, the expansion of gas industry infrastructure, and FERC. A discussion will follow with panelists Rachel Treichler, Yvonne Taylor, Joseph Campbell, and Keith Schue. Refreshments will be served. Last year Oklahoma recorded 857 quakes. That’s more than all the remaining states (excluding Alaska) combined. The previous year (2014) Oklahoma had a record-setting year logging in 585 quakes, after the 2013 record-setting year with 106 quakes. Morrissette claims the state’s Corporation Commission has the authority to act, but is doing nothing. "This is a preventable disaster that our policy makers at 23 and Lincoln and the Corporation Commission refuse to address, because they're afraid politically to act," he told local news reporters. Or it could be that the energy companies are refusing to comply with the Commission’s directives. On December 2, the state sent out letters to six energy companies ordering them to reduce waste water disposal or shut their wells down all together. One company, Sandridge Energy, has refused to close the six problem wells. 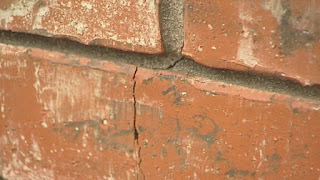 Residents left with cracked foundations and other damage wonder who’s going to pay. 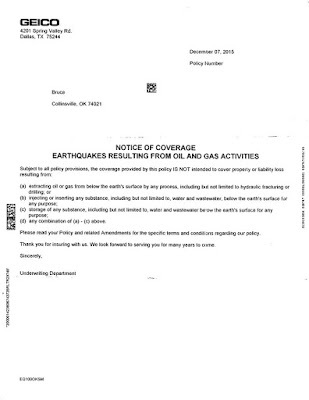 Some insurance companies have already said they will not offer coverage for man-made earthquakes, such as those caused by injection or fracking. Others will, but require their clients to buy endorsements to their homeowner’s policies. 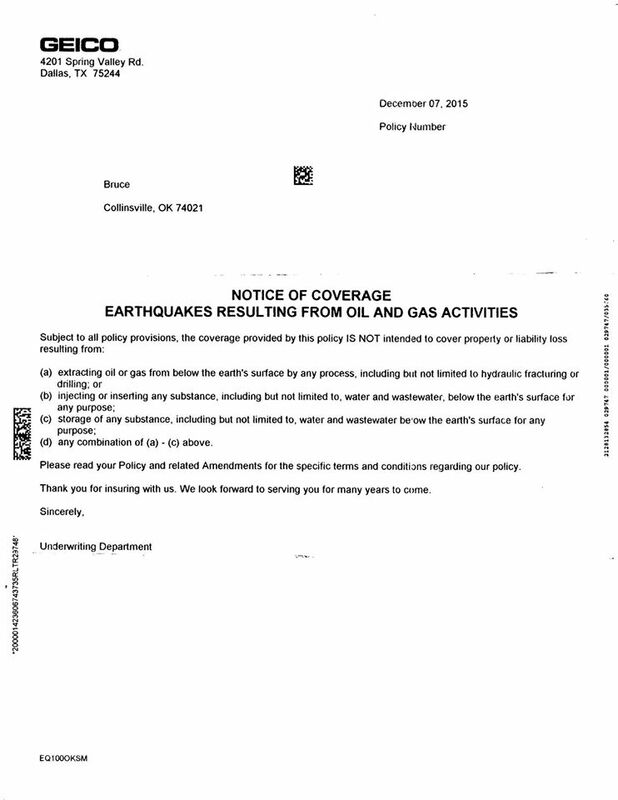 You can read more about fracking-related earthquakes here and here.